Laura completed her lactation training through the University of California San Diego and is a Lactation Educator Counselor (CLEC). She has many years worth of knowledge and experience, personally and professionally, with breastfeeding, pumping and assisting families with lactation from the first latch through years postpartum. Laura works with her doula clients and non-doula clients all over the Twin Cities to provide in-home lactation services. She also teaches Breastfeeding 101 in her teaching space and can teach them in your home! This lady right here was my savior during my 39 hours of labor. (Yep you read that right) Brett was skeptical at first about hiring a doula but we can both agree it was one of the best decisions we ever made to help Miss Penelope into this world. She also is a Lactation counselor as well and helped us tremendously as P had a misaligned jaw at birth. Without Laura I don’t think we could have successfully breastfed. I can’t thank her enough for her knowledge, skills, and compassion during one of the most memorable days of our lives. - Kristi K.
RAW...the placenta is then thinly sliced and dehydrated along with the cord and membranes. After the placenta is dehydrated, the pieces are ground into a fine dust and encapsulated into pill form. TCM...the placenta, membranes and cord are steamed with organic lemon and ginger to infuse heat into your pills (see more below on benefits). It is then dehydrated, ground and encapsulated into pill form. Note: I have also substituted jalepeno for those with allergies to lemon or ginger. "I am so glad I did the encapsulation. I have a lot of family history of mental instability so post partum depression was a real concern of mine. I truly feel the placenta pills help regulate my hormones and kept me on an even keel even though everything else in my life was upside down. There were a couple of days that I got a bit down and tired and then I realized I had not taken my placenta pill those days. It just confirmed for me more that these pills had a drastic affect on my energy and mood. I will definitely do it again next time." - Leah G.
"I highly recommend Laura's placenta encapsulation service. She is safe, timely and responsive. She does the preparation in a designated, separate kitchen. She delivered my placenta capsules to my home within 3 days of my daughter being born, with written instructions on taking them and also discussed with us how to store them. After leaving, she checked in via text within a couple days and then a couple weeks later. I have a history of depression, and with the placenta encapsulation, my moods have been stable post-partum! I have cried happy tears, but there were very few times I have felt "down" or weepy for no reason at all. My energy levels are great, my bleeding was fairly minimal and based on my baby's growth, I know I have a good milk supply! I am so glad I decided to go with placenta encapsulation." 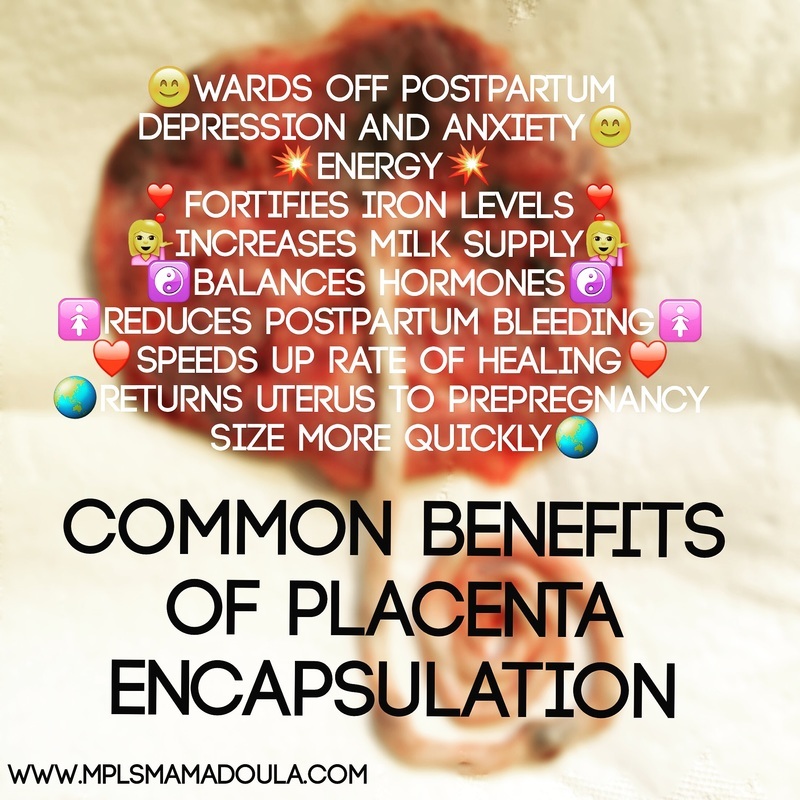 - Kristi L.
This image from MotherWise clearly and concisely displays the benefits of placenta encapsulation. I personally experienced these benefits with my second child. I did not know about encapsulation with my first so had a great comparison between the two births. "This being my first pregnancy, I don't have a basis for comparison, but I will say that I have always been prone to depression and was very worried about the possibility of PPD. I had NO issues whatsoever! I felt great after having my son – bounced back quickly, virtually no negative emotions and no issues with any exhaustion - other than adjusting to the sleep deprivation that comes with having a newborn! I would absolutely do placenta encapsulation with future pregnancies and would recommend to any new mama! Thank you so much for your service - especially being so flexible when I delivered early - I really appreciate you!" "I had a great experience with placenta encapsulation! Very quick healing, great energy, low anxiety, and milk supply has been ideal from the start. I would highly recommend Laura as a doula as well as for placenta preparation." What are the different benefits of RAW vs. TCM preparation? RAW - raw food specialists believe steaming the placenta destroys some of the essential nutrients. RAW method of preparation usually provides a boost of energy and great hormone stabilization. This method will yield the most pills and because of their potency you can usually take fewer and thus make them last longer. TCM - once the baby leaves the uterus, the belief is that this leaves mom very yin or cold. To add yang or heat energy back into the body, TCM adds heat to the empty cavities within mom's abdomen so that she can stay healthy and heal quickly. The placenta is not cooked so it can retain its nutrients but is gently steamed to infuse heat. This method of preparation provides a slow/steady release of energy helping mom to stabilize and balance postpartum. Note: TCM usually yields somewhat less pills - the average is 80-120 - and you need to cease taking your pills temporarily if you become ill.
*I am not a Chinese Herbalist. I use the TCM method based on my trainings from Blooma and Full Circle Placenta. Fresh preparation of the placenta includes cleaning and trimming the placenta and then cutting it into small chunks to cook with or make smoothies. This can be especially helpful immediately after birth. Several pieces will be stored in your refrigerator for easy access. The rest will be cut and sealed for your freezer. You can then use one piece at a time upon preparing smoothies, etc. A tincture is an herbal dropper that you can take in an ongoing basis. A small piece of your placenta is removed and put in a mason jar with 100 proof alcohol. You are given all the pieces of the kit you will need to utilize your tincture - prepared tincture in jar, dropper jar, funnel and cheesecloth. Upon delivery of your pills, I will bring your tincture kit and explain how to use it. A tincture is a six week process of preparation. The wonderful thing about a tincture is that you could keep it going by adding more alcohol to it.